Type erasure is the technique using which the Java compiler translates generic / parameterized type to raw type in Java generics. Type erasure is applicable in the context of generics. Following example illustrates a simple usage of generics in Java. In the above code, we instantiate a generic map using the parameterized type as String for generic type. It provides us the type safety and helps avoid the need for explicit casting. Type erasure is a process to remove these types and map it to raw type in byte code and it is done during compilation by the Java compiler. You can take this as a near formal definition for type erasure. Java compiler replaces generic type information from source and adds casts as needed and delivers the byte code, generics related information are kept as meta-data in the bytecode for debugging, reflection purposes. With respect to general runtime execution, code will look like plain Java without generics. 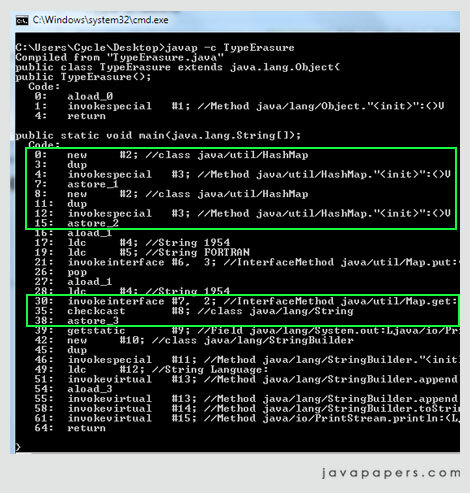 Let us compile the above given Java source file and get a binary class file. Then de-compile that generated class file and inspect what type erasure has done. You may use any Java decompiler of your choice. For now the javap utility is sufficient for this simple inspection purpose. First compile the source and get a Java class file. Then run the command “javap -c TypeErasure“. Here TypeErasure is the name of the Java class. “<String, String>” is missing on code line number 4. See there is no difference in bytecode for genericsMap and noGenericsMap object instantiation. (String)languageMap.get(“1954”) a type cast is added on code line number 35. This is done by the java compiler while compiling java source code to byte code as part of the process java type erasure. Main reason behind having generics and type erasure is to give the programmer ability to write generic code and type safety. Generics is not forced, the generic type can be directly used as raw type instead of supplying parameterized type argument. But it is not a good coding practice. At run-time the generic type is not available in general scenario, that’s what the type erasure does. There are scenarios where people accessing the generic type using reflection or non-java API. Basics of Generics will help us understand that ‘T’ is just a placeholder here and type erasure will remove it during compilation. Generics and type erasure is good for a programmer. Advantage we get in using generics is type safety and clarity in code, so embrace it. Nice catch there , hence i can not see with someone bother use type erasure as a programming technique instead of generics , only use i know of type erasure is to maintain binary compatibility with Java libraries and applications that were created before generics. BTW2, you can very easily test this without resorting to JAD decompilation. Where did that java/lang/Number come from? If type erasure really did remove the generic information from compiled class file, there would be no mention of java.lang.Number as it exists only in generic declarations in the source! As you can see, the exact information about printList() method’s generic argument is placed in the “Signature” section of the class file. Edition, for details about such types. It’s good to read in this site..
Im going to prefer this to my friends!! It really helps me to understand about type erasure with the generics example. Can you explain Java Generics more in Detail in your next post? This type erasure is nice concept,At first time i heard in this . I like this subject very much .Thanks for guide. Great helps and this article is good. Thanks Pinoy, you too have got a nice blog. The point that, “the complete generic information is not erased” is right and I agree with that. Information related to generics are retained as meta information in class file. Thanks Olo, I have updated the tutorial above. But erasure happens during runtime is wrong, it happens during compile time. Thats fine. Yes thats right, type erasure does not completely erase the generics information and it retains type information as meta-data in binary class. This is one of the reasons why Java has so much hate attached to it. Unfortunately it could of been a good language but due to the little things like type erasure, it has become a target of hate. Comments are closed for "Type Erasure".